K: for George Orwell and the Old Barbet! Just like when you have a song in your head and it won't go away, for the last 2 days what I am going to share with you has not left my head. I will share it aloud here, because it is important and has nothing to do with people who can't think in their heads any more and anything they think comes out through their mouths, regardless of its importance. In the Thesis below, done in 1991, like in G Orwell's 1984, this person had prediced what would happen to the breed IF the sizes of the dogs was not brought down rapidly. 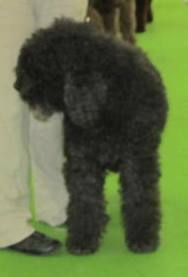 one pure Barbet ( which descended from the 1930's dogs) and the one built from dogs with no origins crossed with poodles, the dogs had a completely different morphology,and measurements were the proof that he used. Those measurements, I have. 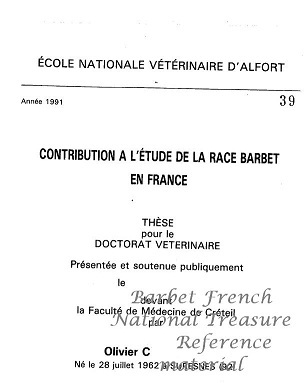 He has and he was able to prove that they corresponded to the dogs of M Le Houelleur and Dr Vincenti's dogs. Another fact: when measuring the dogs issued from poodles and poodle types the proportions of the head were completely reversed while they were still the same size, as the pure Barbets. ( despite what it says in the standard !) Can you even imagine?????? DNA is not even necessary, you take the raw dog and you can prove how what was done to the breed has nothing to do with what J de Coninck wrote as a standard. Nothing. The fact that the Ayme family was the link from the 40's to the 70's was not even a question,but a fact, meaning that it happened after 1991. It was very disturbing reading because it allowed me to connect a lot of information, and to wonder how many people knew about this and have deliberately hidden the information for 20 years in order to better create a living space for their master race. It is as clear as cristal and as a matter of fact in my own corner I was proving what he had said without knowing about it.......that is scary. I have taken photos from here and there and made size families. So 20 years later......like in 1984...How can people have lied or withheld such important information to only destroy a breed? I just cannot believe it. These people are supported by the incompetence of others who flap their lips with nothing to say but their thoughts out loud. Monsieur Barbet du Pré Lévêque. Photo removed for very private reasons that I fully respect, until I have another one. Common ancestors, going back to a long line of poodles.There are many others and they all fit in the scenario: the history of the modern barbet reconstructed in a reverse "selection" process to eradicated the Griffon Barbet for which the standard was written. and make sure dogs with Barbet blood are eradicated and that is the scenario you are reliving from 20 years ago. Disregard proportions, accept and encourage incompetence and tall square dogs who are only selected on coat, and you are a proud contributor to the destruction of a rare French breed. Judges are not any better....when it comes to some being incompetent.The list is long. 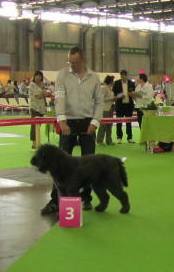 And don't get me going on sizes and weight, because that is not true either.A 60 cm dog is not a Barbet.Much less at 63 or 65.